The other day I had mentioned that I was playing mad scientist and created a few of my very own frankenpolishes. I really wanted to make some colors that I couldn't buy anywhere. There are not enough greens, purples, glitters or holos in the universe, so I attempted to make a couple! As always, please click the image to view full size. #1. Bright purple holo with slight green duochrome, green, holographic and blue glitter. #2. Medium green with varying shades of purple glitter. #3. Dark forest green and gold holo. #4. This isn't blue! It's bright purple! Bright purple with green duochrome and glitter. #5. Metallic olive green with holographic glitter. #6. Bright purple/blue duochrome loaded with iridescent and multicolored pink, purple, blue and holographic glitter. #7. Deep green with holographic glitter. #8. Luminous dark green shimmery metallic. #9. My very own homemade holographic glitter topcoat! Unbelievably sparkly. #8 with #9 on top. So, how did I do? I love all my colors! I've since made a bunch more 'frankenpolishes' and I think I'm hooked! I love making my own colors! These are awesome. I really like the olive green and forest green polishes. so, like when are you starting your own company??? because,i want EVERY SINGLE one of those polishes you just frankened, and i usually think alot of frankens are just normal and kinda boring, they take skilll....and girl you got it !!! #1 reminds me of a better version of OPI DS Royal! Pretty, pretty! And my hubby said "wow!" to your homemade topcoat! All are very creative, Scrangie! Can't wait to see what others you made! They look awesome! I am in loooove with 4 and 8! Everyone of them was TO DIE FOR!!! I'd buy them! Those are so nice! Can you make #1, #2, #3, #4, #7, #8, #9 for the rest of us? how did you make #1? i need it. Oooh, publish the recipes, pleeeeeze? Gorgeous! I have frankened four polishes, two dark greens with holo-glitter and one steel blue and one dark, midnight blue with holo glitter. I love them! It is great fun to do your own colors! damn - they are all gorgeous! (also i have no idea how to get polish in another bottle - other than drop by drop). A++++ for your post scrangie! The colors are amazing and so perfect. If you start selling your frankenpolishes, you're going to be rich, rich, rich! :D Wow, I absolutely love that first purple one, and all the green ones are to die for! mass produce #8!!!!!!! I love it!! I had a peacock color like this a long time ago and I have looked to find another like it and I can't find it anywhere. That is exactly what I was looking for!!! Beautiful work, Scrangie! Seriously, you could start your own polish company with some of your creations. If I had the cash, I would definitely back you in this venture! Ooh, Scrangie, #8 is GORGEOUS! The olive green one is just incredible!!! i love them the purples and blues esp! scrangie, we need answers to these questions.. particularly what glitters do you use. i'm always looking for shimmer-- party on the nails!-- but not fat junior high school glitters.......???? GH, hehehe that would be cool! Scrangie brand nail polish! Chiffy, hehe that would be fun! Nitzan, thank you so much!! Atomica, hmm, I like that idea! :D Thank you! just from one bottle into another? he, that sounds good to a really awkward me. i really need to try, i will buy some cheap stuff this week and do it! 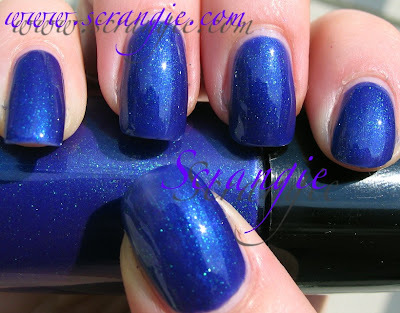 Scrangie, I REALLY think you should be creating your own line of polishes. REALLY. SERIOUSLY!! I second all the other folks who said you should start your own polish brand. Think about it: you are a total expert in this field. You absolutely know what the market wants. You know what's missing. You have a niche. You have an audience. And I certainly would buy up all your polishes. So do it! scrangie's secret blend of funky colours! I'd like to see a lot of those, especially the last one the #8/#9 combination, with the essie Matte top coat finisher. These are amazing - especially #3, the dark forest green with gold holo! Just beautiful. Random Black Polish Swatches and Comparisons! Random nail-related post of the day. Rescue Beauty Lounge Fall 2008 Swatches! Rescue Beauty Lounge Fall/Winter 2008 Preview!